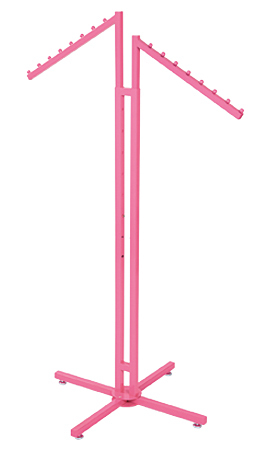 The Hot Pink 2-Way Clothing Rack- Slant Arms is sure to add an eye-catching, stylish element to your showroom. This rack features a hot pink finish with slant arms to highlight merchandise at an incline, showing off each piece of apparel. This rack features push button arms that make it easy to adjust in 3" increments from 48" to 72" tall.